British boxing legend and former World Boxing Council (WBC) cruiserweight champion Tony Bellew has advised Fatuma Zarika to impose her hard-hitting antics on Zambian sensation Catherine Phiri during the World Boxing Council (WBC) title contest. He described Zarika as a better fighter of the two. “I know the fight will not be easy but I know the battle is well within Zarika’s expectation,” he quipped. Bellew arrived in town on Wednesday night ready for Saturday’s Nairobi Fight Night extravaganza which will also feature mouth-watering support bouts at the Kenyatta International Convention Centre. Zarika will today come face to face with the Zambian pugilist during the weigh-in and pre-match medical programmed for Hotel Inter-Continental. In attendance will be WBC technical and Kenya Professional Boxing Commission (KPBC) top brass. The visiting English Premier League (EPL) Everton FC ambassador is in his first visit to the country to watch his friend and WBC women Super bantamweight titleholder, Zarika who has put her title on the line against Zambia’s Phiri in the main event of the boxing extravaganza. Bellew spent three weeks with Zarika and rising Tanzanian sensation, Hassan ‘Champez’ Mwakinyo in the UK aiding them to prepare for their bouts against Phiri and seasoned Argentine Sergio ‘El Tigre’ Gonzalez during the fight. “I expect both fighters to be successful on the day. I can’t wait to see things going as per our expectations,” Bellew said upon arrival at Nairobi’s Jomo Kenyatta International Airport. The former Commonwealth Games titleholder teamed up with renowned British boxing trainers John McNally and Declan O’Rourke to train Zarika and Mwakinyo at the Rotunda Gymnasium in Liverpool. “The boxers trained hard and we worked on their understanding and listening abilities. We ensured they are in shape and gained more strength than they had before coming. Right now, they can do whatever they want to do in the ring because of fitness,” Bellew explained. 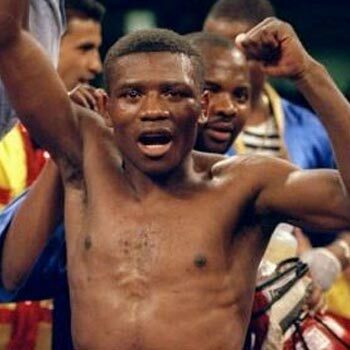 The former world beater is happy that Mwakinyo, who was in his first trip to train in the United Kingdom, got the opportunity to learn professional boxing at the top level having made his name as one of Africa’s biggest emerging talent. McNally echoed Bellew’s sentiments adding they had laid out a strategy to ensure both boxers left the ring with the sound of victory ringing in their ears. “All we are waiting for are the execution on Saturday and hopefully, we shall have a knockout,” McNally affirmed. The three tacticians already have a vision for Zarika to become a unified world champion and add the International Boxing Federation, World Boxing Association and the World Boxing Organization titles despite the fact the Kenyan has expressed her wishes to step down this year.